You need to know how to light a water heater when your pilot light goes out. Without the pilot light a gas hot water heater will not work and you won't have any hot water. Lighting the pilot light will take about fifteen minutes. Not sure if this is your problem? See 'Gas Hot Water Heater Troubleshooting' for a complete listing of all the possible problems and how to solve them. For most hot water heaters, you do not have a choice. You need to use a long match or utility lighter. The reason is that the pilot light is inside of the water heater a few inches and it is difficult to reach. A lighter is a much better choice since the flame will remain constant. The best tool for the job is a 'Utility' or 'Multi Purpose' lighter. This is the style with a long nose on it. They are ten or twelve inches long, plenty long enough to reach the pilot light inside opening. Some water heaters are equipped with an igniter. These are similar to the igniters on a gas grill. 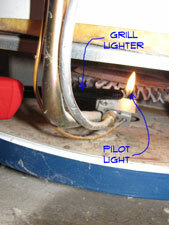 The article 'Lighting a Pilot With an Igniter' has information on this method. Different water heaters have different procedures for lighting the pilot. Usually, there is a waiting period involved before can turn dial to pilot. Look on the side of your hot water tank and read through the procedure that is required for your water heater. Failing to follow these instructions may result in the pilot not lighting. This topic is discussed further in the article, 'Following Pilot Light Instructions'. The following is a general description of the steps involved. Make sure you read the instructions on your water heater before proceeding, they may differ from what is stated below. Make sure that the temperature setting is on its lowest position. Then turn the gas valve to 'Off'. You should wait about ten minutes before you do anything else, or as long as the instructions indicate. There may be some lingering gas that you want to dissipate before you try to light the pilot. The next step is to remove the outer cover from the burner assembly. It should snap off. There is usually an inner cover that you will also need to remove. A small flashlight would not hurt at this point. Do you see where the pilot assembly is? Good, you want to make sure you have a long match or grill lighter that can reach it. You will usually turn the dial to 'Pilot' and hold down the button. Make sure you are ready with the lighter or match. If the pilot does not light quick enough the gas valve will shut down and you will have to wait again. Light the pilot and hold the button down for as long as it tells you. Watch through the glass and make sure the pilot stays lit. Wait the proper amount of time and turn the gas valve to on. After that you can set the thermostat to the desired temperature. If the water has been off for any length of time the burner should light right away. Make sure it is burning properly and replace the outer cover. You followed the instructions, tried a couple of times and the pilot will not light. Another situation is a pilot light that will not stay lit. What do you do? You may have another issue. A pilot light that lights initially and then goes out is the sign of a bad 'Thermocouple'. See the article on 'Gas Water Heater Thermocouples' for more information on what to do. If the pilot light will not light at all, it could be the gas valve that is the problem. See the article 'Hot Water Heater Gas Valves' for information and options on what can be done. Following the instructions above, you should have been able to successfully light the pilot light on your water heater. If not it is possible that you have another problem.